More and more couples are including additional cards and details with their wedding invitations so that their guests will have all the information they need to enjoy the big day in style. From RSVPs, accommodation details, maps, directions, gift lists, or even an itinerary of the day itself, the amount of extra information to include with your wedding invitation is really up to you and will depend on the type of wedding. If many of your guests are travelling some distance, or possibly from other countries, transport details, maps and accommodation suggestions will be sure to help them in planning a smooth and stress-free journey. 1. Rustic twine. Tying with jute or rustic twine is a great way to add that rustic, country feel to your wedding invitation stack. Add a tag for a lovely finish touch. Rustic Country Garden by To Have To Hold. 2. 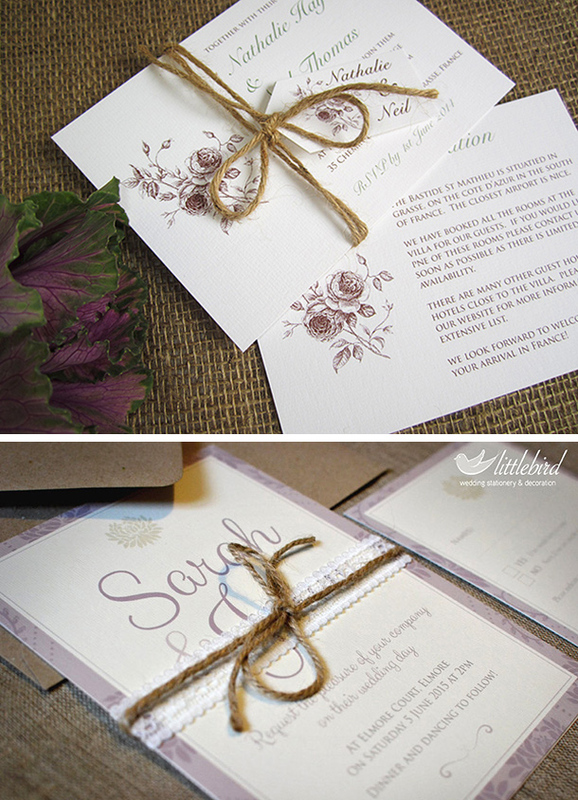 Printed bellybands are an elegant and stylish way to combine your wedding invitation elements. 3. Hessian or lace bellybands give a lovely rustic feel – perfect for a rustic country wedding. 4. Baker’s string is available in a wide range of different colours to match your stationery colour scheme. 5. Satin or organza ribbon give an elegant finishing touch to any wedding stationery suite. Happy Valentine’s Day to all of our wedding couples and designers! To get you in the mood for romance why not take a look at our latest inspirations board for some great ideas for romantic wedding invitations. Add romantic lovebirds, hearts or roses to your wedding invitation design – pretty pinks and sumptuous red will be sure to get your wedding day off to a wonderfully romantic start! For added luxury wrap your ribbon in gorgous ribbons of silk, satin, lace or organza. And why not add wonderfully romantic script typeface and calligraphy to your wedding stationery for that extra special touch. Take a peek at some of the wonderful ideas from our designers below and have a wonderful valentines day! Happy New Year to all of our wonderful readers! If you have become engaged over the Christmas break or are planning your wedding for 2015, we would love to help you find the most beautiful and creative wedding stationery that reflects your own style for the perfect wedding day. We work with many of the best indie wedding stationery designers in the UK and we regularly feature designs from all over the world. So whatever your wedding theme – from vintage and traditional to rustic shabby chic or clean, modern or contemporary designs, we are always on the lookout for the best wedding invitations and unique, creative designs. We thought we would start off the New Year with a look at some of our personal favourites from our own designers and from other designers who’s work we admire. Take a look below at some of our best sellers of 2014 and some of the new designs that have caught our eye for 2015! The ‘Village Fete’ or Wedding Tea Party’ theme was very popular in 2014 and we expect that trend to continue. ‘It Must be Fete’ by To Have To Hold design studio, has been the most repinned design on our Pinterest board in 2014 and continues to be a firm favourite with brides. The pretty bunting design comes in a printed version or with handmade, fabric bunting. 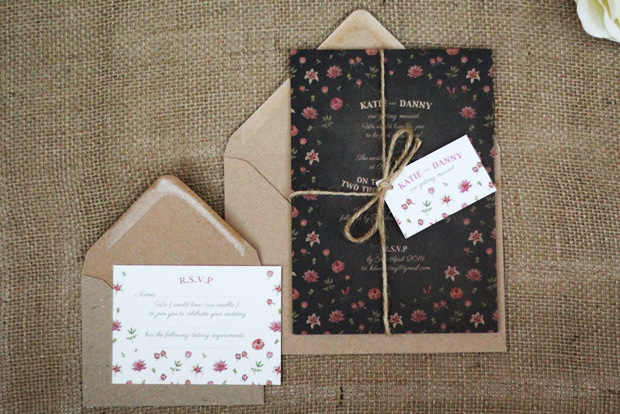 You can have the invitaiton on it’s own or bundle with RSVP and guest card and wrap in twine and tage for a lovely rustic effect. Staying on the bunting theme is the pretty, shabby chic design by SJ Designs. ‘Village Fete’ wedding invitaiton will announce your rustic, tea party wedding perfectly! This printed design comes in a colour of your choice and has the bride and groom initials and wedding date incorprated into the bunting. Bundled with an RSVP and guest information cards, this invitaton suite is tied with twine or string and finished with a personalised wedding tag. Lovely! Again on a rustic, vintage wedding theme, we just love the original designs by Andrew from ‘Vintage Designs‘. Andrew’s creative, rustic design use illustration and old typography to create truly unique wedding stationery that will be sure to make your wedding stand out from the crowd. We love his trade-mark ‘ticket’ designs in particular. Great for a movie or cinema themed wedding or destination wedding perhaps. A movie ticket inspired invitation which incorporates the invitation, info card and RSVP into a strip of tickets which are perforated so you can tear apart easily. Great for a cinema themed wedding. A unique design created in the form of an old ticket with all the style and elegance of the turn of the century art nouveau movement. Staying on the rustic wedding theme, the ‘Tying the Knot’ wedding invitation is a great, quirky design with a knotted string inside the card which allows guests to ‘tie the knot’ as they open their invitation. If you have a lot of information to provide for your quests then pocketfold wedding invitations and wallets are a great way to package all the information you need into one elegant package. Several of our designers specialise in Pocketfold designs – Little Angel Weddings, Wedding Paraphernalia , Purple Mountain Designs, The Cardlab Letterpress Company and To have to hold all offer a great range of popular designs in a range of styles from rustic and vintage to traditional or contemporary. The Cardlab Letterpress Company offer a stunning range of wallets and pocketfolds and offer Letterpress printing. For those looking for traditional, classic style invitations to announce their wedding day, look on over to the Letter Press of Cirencester, Piccolo Press or The Cardlab Letterpress company for some timeless designs. Probably our best selling design, ‘Bond St‘ and ‘New Bond St‘ designs by the Letter Press of Cirencester offer stylish simplicity with a platesunk border and raised print. An understated yet elegant classic that does not fade in popularity year on year. ‘Insignia‘ and ‘Gilded‘ by the Letter Press of Cirencester are also perennial favourites for those choosing a classic, stylish wedding. These invitations are both letterpress printed on very heavy board with luxurious foiled initials and gilded edges. A real touch of luxury! Or you may choose to keep to the traditional favourite – a classic folded invitaiton with raised black print. It simply cannot be beaten for understaed simplicity and elegance. The ‘Classic‘, ‘Regency‘ and ‘Shelley‘ designs never date and are consistently popular designs. Letterpress wedding invitations have always been a great favourite in the United States and here to the trend for this vintage printing method is increasing year on year. There are many indie designers in the UK offering truly creative designs. These are just a few of our favoutites from our designers..
Embossing is almost the opposite of letterpress and is where print or a pattern is raised off the paper rather than indented. Sarah O’Neil Designs specialises in some beautiful embossed designs which are elegant, clean, modern designs.